Ambient air consists of 20,9 % oxygen and 78,1 % nitrogen. It provides basically unlimited source for gas separation. Because the gases are separated uder pressure, compressed air is used. Any kind of compressor can be used to provide the necessary compressed air, but in industrial applications screw compressors or rotary vane compressors are recommended. The compressed air shall be dried before the gas separation process: in most cases a refrigeration drier is satisfactory. 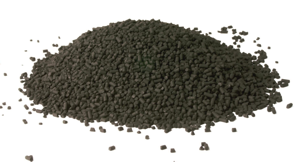 The purification of gasses are performed by molecular sieves in gas generators. These materials are not "sieves" in the conventional sense. They are porous materials with extremely high porosity, and their specific surface is very high - it can exceed 1000 m2 /g value. Internal channels of molecular sieves are in the molecular size range. Therefore, different gas molecules, having different physical size, are separated by these channels. Molecular sieves adsorb different gas molecules by different speed. Molecular sieves adsorb significant amount of gas by increasing the gas pressure - the volume of adsorbed gas exceeds the sieve volume several times, depending on the applied pressure. 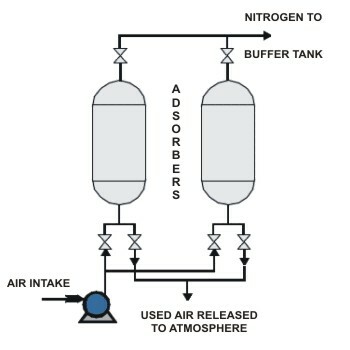 Oxygen is preferentially adsorbed by carbon molecular sieve, nitrogen is preferentially adsorbed by zeolite molecular sieve. When the pressure is elevated over the molecular sieve, the preferentially adsorbed gas is adsorbed on the sieve, and the less preferentially gas is enriched in gas phase. This purified gas can be obtained, as product gas. After the production phase, the sieve is depressurized, and the adsorbed gas molecules are desorbed on the effect of lowered pressure. The sieve returns to the state where it was before pressurization. As there is no change of sieve material through the pressurization/depressurization process, the sieve can be used infinitely. Gas generators apply the gas mixture containing the gas to be purified to an adsorption column filled with molecular sieve. The sieve is specific to the product gas - the product gas is adsorbed slower and in less amount, than other gases. Pressure of adsorption column is increased to 6-7 bar. The product gas passes through the column, but the impurities are adsorbed on the molecular sieve. After the sieve is saturated by impurities, the process is stopped, and the column is depressurized. Adsorbed impurities are desorbed by the decreased pressure, and vented to atmosphere.Than, small amount of purified product gas is used to backflush the column to remove residues of impurities. Gas generators usually operate adsorption columns in pair: one column is in the production phase, the other one is in the purification phase. Operation is cyclic: columns rotate between production and purification phases. This technology is called Pressure Swing Adsorption ( PSA ) technology for the cyclical pressure changes. PSA systems are robust, well proven units. Size of units range from laboratory size units (1-2 dm3/minute flow) to large, industrial systems (several thousand m3/hour flow).